Looking for the perfect self-sustaining chicken coop plan? If you’re in need of some chicken coop plans, then this is a must-know and a must-try! Building a chicken coop isn’t that hard. However, you need a detailed plan before building one. This is very crucial because the happiness and healthiness of your chickens depend mainly on the coop. The success of your flock also depends on the environment you give them, so be very careful in making your chicken coop. My old man was the type who never liked to waste his time or energy. He would always be looking for better and more efficient ways to get the job done. He especially looked for such ways when he had to perform chores. There were two chores I know he enjoyed doing, and that was raising the chickens and gardening. My father decided on his own that he could make both raising a chick flock and gardening more likable by finding a way to make them more efficient. He noticed that both of these tasks were feeding operations. When you have a garden, you make sure you properly feed it so that it can grow great food. You want to ensure you feed your chickens because they in return will make you a surplus of eggs and more offspring. My dad made up his mind that the best way to make both these jobs easier was to combine then and allow them to feed one another. The way he decided he would accomplish this was building a “self ­fertilizing” chicken coop/garden. It was so basic of an idea that my dad could not have been the first person to come up with and do it. Still, it was the first time for me to see anything like it. My father decided that he would make a chicken coop with little doors, one on the East side and one on the West side. On the North side of the coop, there was a standard sized door for us to enter. On the South end, there was a wide window with a hinged cover made of wood. The window faced directly out to the compost heap. Each time that we cleaned the coop, we would shovel everything out to the compost through the window. The first year of chickens that we raised had the run of the yard on the East side of the coop. My father kept all the doors on the west side closed off. In the West yard, he planted our vegetable garden for everyone to enjoy. By dividing the yards to East and West, he told me that both yards had good exposure to the sun. Since the North side of the coop was in the shade most of the time, it made the most sense to put our door there. Teri Page (@homestead_honey) knows the importance of starting your kids young: “Accompanying my favorite little guy for his daily egg collection. We moved into this land when we was still a little nursing toddler. Now he’s competent, confident, making plans, taking charge of chores.” | Do you have any stories you want us to feature? Use the hashtag #HappyHomesteading. We put fences around the yards to protect the chickens from predators and control where they went. In the yard we let the chickens into, they would eat weeds and insects, and their droppings would fertilize the soil, so the yard would be ready for planting next season. During the fall season, after the years’ gardening was completed, my dad would shut the door on the East side of the coop and open the door on the West side. All of the chickens were now in charge of running the old garden, eating the remaining plants and weeds and fertilizing the soil with their droppings. In the meantime, my dad was set about turning over the chicken dropping enriched soil that was on the East side of the yard. The chickens were now on the West side and were happily moving about the old garden to get ready for the following year’s garden. It is such an efficient method that my dad never found the need to improve things. He kept this highly efficient chicken coop/garden going strong for years. And that’s it. Just remember, a chicken coop doesn’t need to be difficult and complicated. With a proper layout, you’ll be able to provide your chickens a comfortable and secure chicken coop they can enjoy. Did you find this chicken coop plan helpful and interesting? Let us know in the comments section below. Want to know how build a backyard chicken coop? 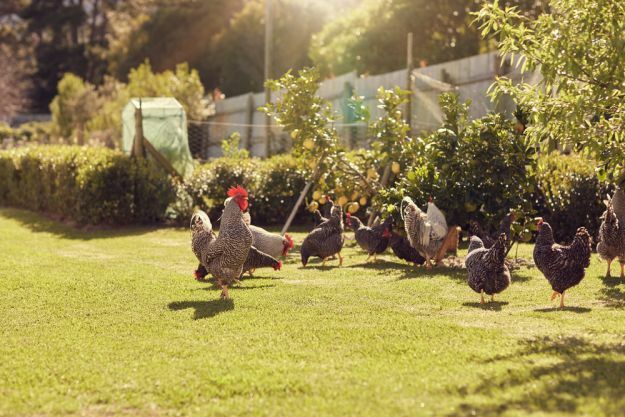 Check out here How To Build A Backyard Chicken Coop and keep your backyard flock happy and protected! This post was originally published in November 2015 and has been updated for quality and relevancy.